When one of your primary business goals is to be the top choice for patients in your field, everything you do to get there has to be top notch. Dr. Frank “Cinco” Feuille, founder of Implant & Laser Periodontal Surgery Center, is a perfect example. 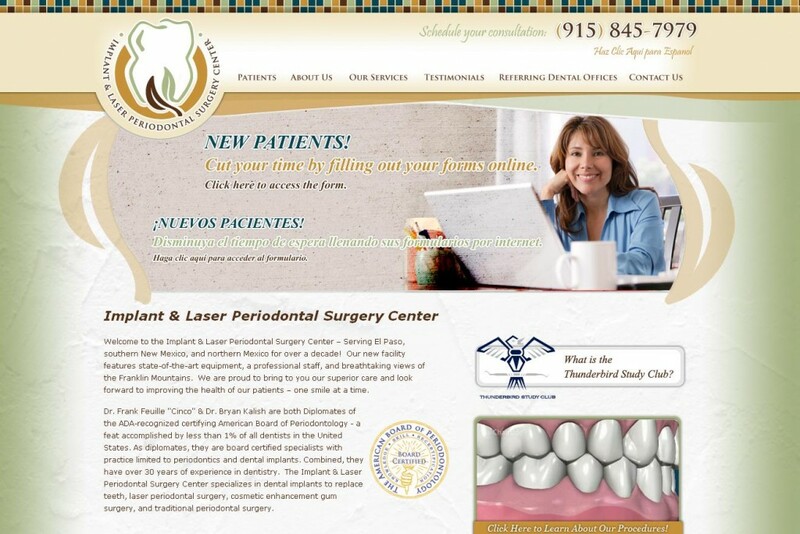 The homepage for the El Paso Implant & Laser Periodontal Surgery Center website includes a link to their Facebook page, a banner with rotating messages and a video which details some of their procedures. A quick tour through their office reveals top-of-the-line dental equipment and industry related technology. In 2009, a decade after beginning his practice, Dr. Feuille moved to a new facility off scenic Helen of Troy Drive and added more professionals to his team. When it came time to update the online presence, they weren’t going to settle for an average website so they called on Stanton Street to work on the project. A few main requests included developing a website that stood apart from the competition with a professional and clean design, easy navigation and smooth functionality. The website also needed access to outside systems where patients could log in to access various forms and make online payments. Any patient would find it beneficial to become familiar with an upcoming procedure. Therefore, ample information on treatments is available throughout the website along with animated educational videos for select procedures. It was also important for the website to help the team streamline some of their processes. Stanton Street assisted with this need by building functionality into the website that would allow partnering dentists to easily send various types of files. “A very unique feature, created solely for the Implant & Laser Periodontal Surgery Center, was the ability for other dental practices to not only refer their patients’ information but they can now upload correspondences, clinical photos, and digital radiographs – all in a secured manner. The Stanton Street staff is very professional and created a one-of-a-kind experience,” said The Implant & Laser Periodontal Surgery Center’s Dr. Bryan Kalish. The website also includes rotating images on the homepage, an area where users can “like” and access the client’s Facebook page and a section with client testimonials that allows patients to make their own submissions. If your company is ready for a new website, you can click here to check it out. Of course, if you’re in need of dental implants or gum surgery, you should definitely take a peek as well!